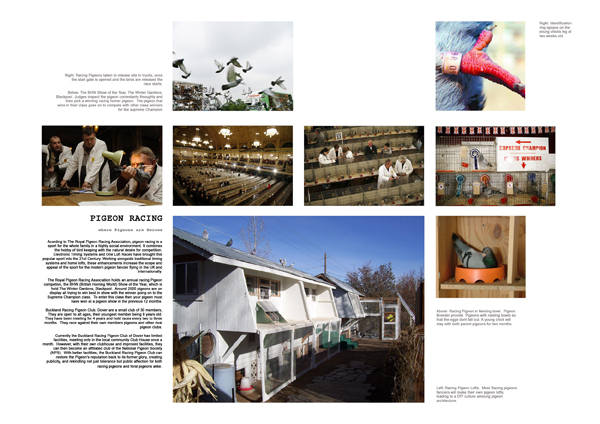 This week we’re happy to share with you our interview with Carla Novak, the desinger behind the winning project titled Pigeon Racing Headquarters. We think the project is a witty revival of a past urban/animal event and a particularly subversive one at that. We think you’ll agree that Carla has some excellent ideas about how the lowly pigeon can re-invent itself in the dense metropolitan world of today’s cities. Firstly, we’d like to talk with you about your beginnings. How did you become interested in exploring the space between humans and other species? Where would you say your work began and are you where you thought you’d be? Where do you feel that you’re going? In my work I particularly enjoy exploring architectural vernacular, actively subverting the often jarred relationship between the contemporary and the nostalgic, and reanimating the ordinary and the familiar as a means of stimulating new perceptions and alternative urban conditions. The pigeon is such a familiar bird in Britain, however it’s rich cultural history has been forgotten and now sits at odds with its lowly status as a mere urban irritation. Pigeon racing is a fascinating sport because whilst the pigeons themselves might fly from exotic international locations, the reality is that the hobby itself primarily occurs in the back yards and garden sheds of ordinary homes for which pigeon racing is an interest – and so it occupies an intriguing threshold between the domestic and the non-domestic. It seemed perfectly logical to me then, that a pigeon racing headquarters for a group of enthusiasts might materialize within an ordinary Victorian terraced house. When I came across a Pigeon Racing Club in Dover I felt it gave an opportunity to design a clubhouse that tried to stimulate an appreciation of pigeons. 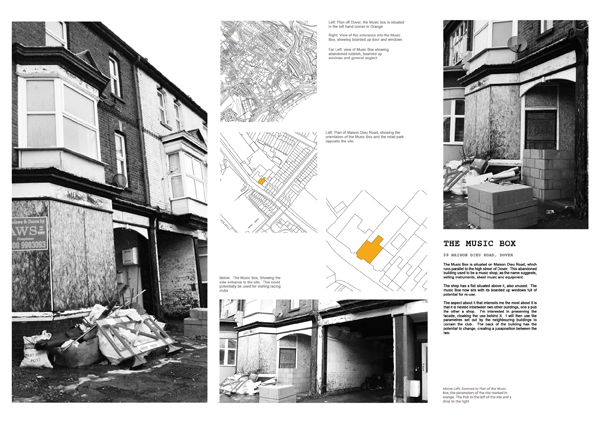 I thought it might be an interesting tactic to bring the pigeon in from the garden shed to the house – The idea that Pigeon Racers might become so fanatical that the domesticated spaces of the house might become inhabited by the members and the pigeons in equal measure was the ongoing narrative for the project. Indeed, as the project developed the programs of the club became subservient to the pigeons and their requirements, which seemed a wholly appropriate spatial outcome of the priorities of a fanatical relationship. I enjoy juxtaposing programs and narratives in architecture and I feel that this it creates a more diverse and rich project. I hope my work will continue to explore these themes. 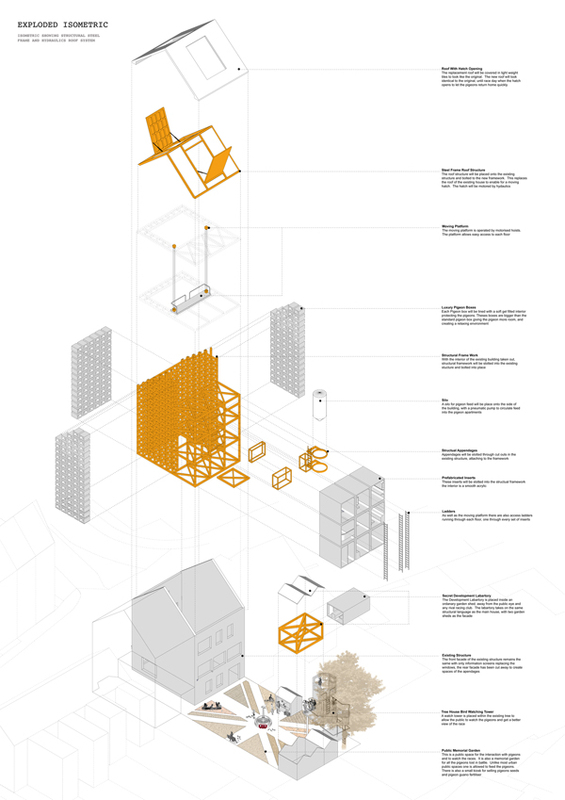 With my design for the pigeon racing headquarters I felt it was important (and indeed fun) to work within the familiar and appropriate vernacular of garden sheds and typical British back gardens, and to imagine the materialistic qualities of this language. 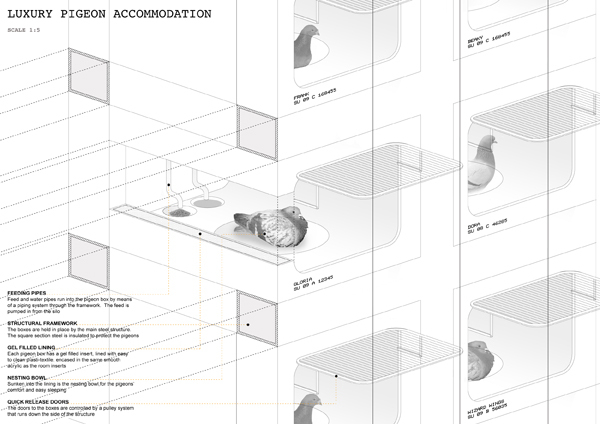 It was also important to consider the pigeon’s needs: to look at the size and proportion of a pigeon and its movement, to consider the domestic scale of the building and interventions to its fabric, its internal elements and the various openings that pierce/expose the outside of the building to varying degrees. This process was emphasized in the luxury pigeon apartments, which moved beyond the basic needs of the pigeon, and the traditional archetype of the pigeon coop, and provided larger than average dimensions, soft lining, heating and feeding pipes. In this respect, the architecture inhabited by the pigeons takes precedence over the more basic facilities provided for the club members, establishing and maintaining a hierarchy of importance in which the pigeons become the primary occupant and the human inhabitants work around them. Another important element of the project was that Dover is historically the closest town to France and in many ways represents a threshold with continental Europe. In the second world war, pigeons were trained to carry messages to army regiments in the battlefields, and some even had makeshift cameras fixed to them in order to spy on enemy activities. Pigeons were awarded official medals for service to the country during this period. By citing the project in Dover, in which one is very aware of a spatial proximity to the continent, the historical implications of pigeon activities takes on an additional social dimension that might encourage the public to reassess their opinions of pigeons. The Pigeon Racing Headquarters offers a unique new collaboration with other species, asking questions and provoking alternative species perspectives – how does your creative process begin in bridging the species divide that exists between us and other animals? Moreover, why do you think it’s important to do so? In Britain, pigeons are considered pests and I think we have a zoophobic attitude towards animals, in that we are ‘animal lovers’ as long as they are in a cage or on a lead. I think by designing buildings and creating situations where there is interaction with non-exotic animals this attitude might be reconsidered. 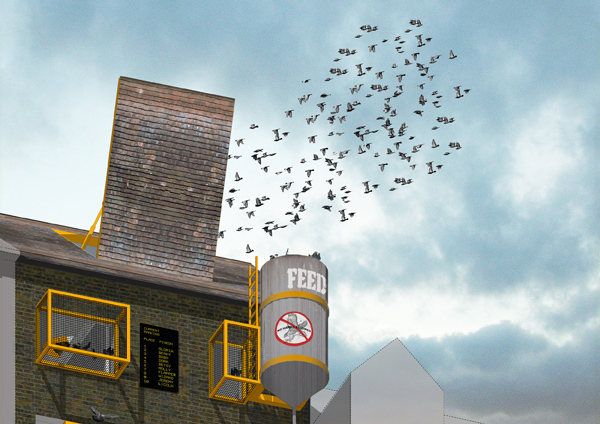 In this design the hope was that an interface between pigeon racing and the public might become a catalyst for people to reassess their opinions of pigeons more generally. 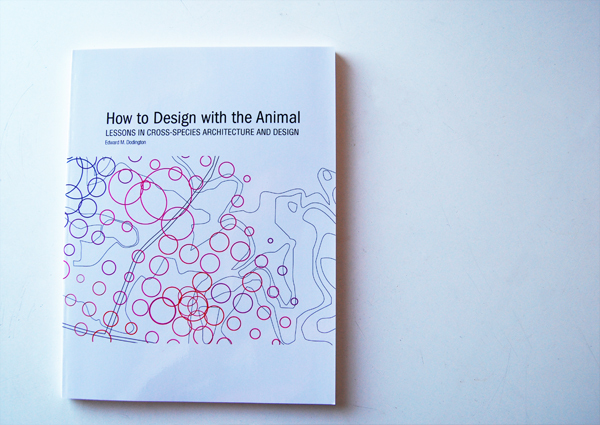 In addition to this, ever-increasing urbanisation on a global scale means we owe it to the other species that occupy our towns and cities to consider how they too might exist and thrive within the urban condition, and there is an opportunity for our relationship with other species be considered and tested through speculative design. What kind of choices go into the type of technology used for the collaborations you create? More generally, how do you view technology in your work? With the Pigeon headquarters I tried to set up a disjuncture between the interesting if eccentric DIY architecture that emanates from back garden activities – elaborate sheds, tree houses, basic pulley systems etc – with which we are all familiar and which has a latent domesticity to it, with a kind of small scale high tech architecture that one might imagine developing out of a certain degree of competitive hobby fanaticism and that alludes to the war time roles that pigeons held in the past – pneumatic hatches, video screens and display systems that front onto the street, pigeon cams and a breeding lab. Recently, the project was presented to the public at a symposium in Dover, UK (the town where the project was sited) regarding the town’s regeneration plans and this generated considerable interest. The project has also been used as a precedent in a recent undergraduate animal habitat project at Canterbury School of Architecture which asked students to devise an ‘inhabitat’, that is, an inhabitable space that propagates a system of flora and fauna whilst simultaneously allowing the occupant to interact with this ‘inhabitat’. I was invited to be on the crit panel at the end of the project. 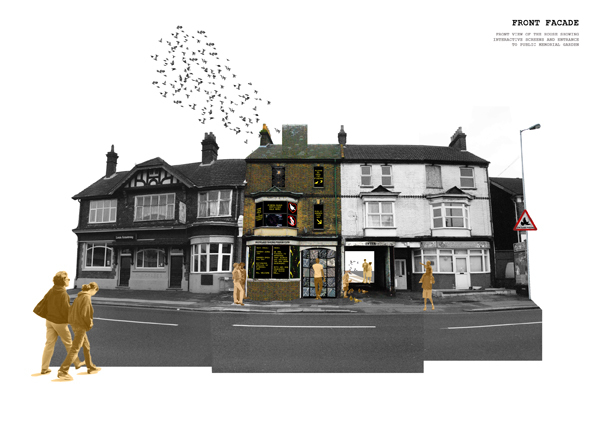 The Pigeon Headquarters project has been well received by the public; I believe this is because pigeon racing has been (a somewhat eccentric) part of British culture for many years and by considering it within the context of Dover, which has a long-standing war-time connection, the project begins to interact with wider social conditions and references that might re-stimulate the previously heroic reputation of pigeons. Speaking of Public…how important is the public or a publicness to your work? I enjoy working with the public in developing my projects, especially when the design initiates or maintains discourse with the public as a fundamental design action. I think it’s important to get involved and obtain feedback from the public when you can – this keeps the design relevant. I have actively sought to exhibit some of my work in the towns/cities that the projects have been set within, and it’s always interesting to hear local people comment on the work – even if they don’t always agree with the design! To exhibit work in a way that sets up immediate adjacencies between it and the context within which it is sited is an important act of feedback in my view. A link to a very entertaining video of pigeon racing can be found here.